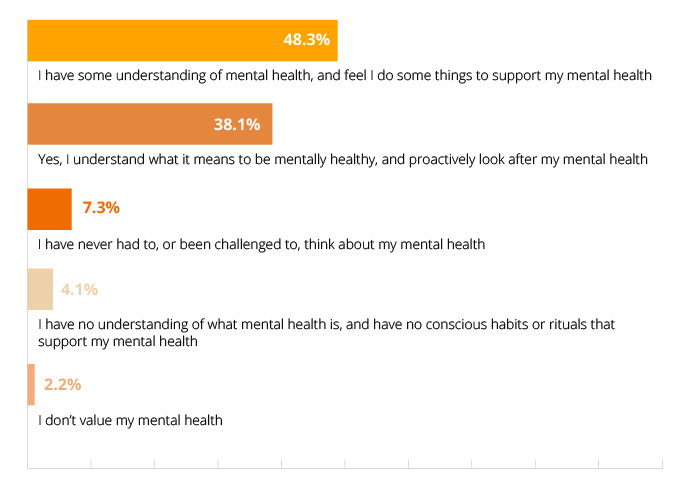 41.6% of Australians surveyed said their relationship with themselves is healthy and compassionate. 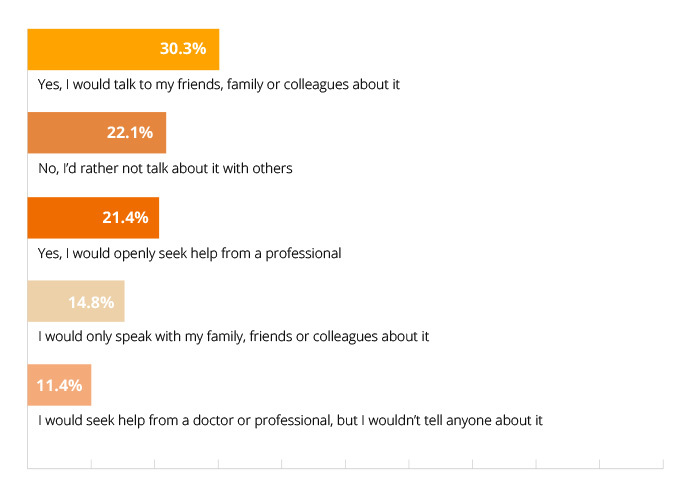 30.3% of Australians surveyed said yes, they would talk to their friends, family or colleagues about it. 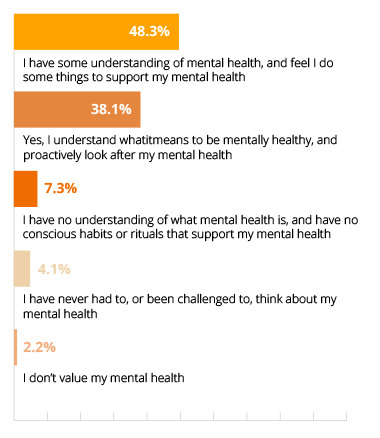 48.3% of Australians surveyed said they have some understanding of mental health, and feel they do some things to support their mental health. I generally always know how to place my own feelings, and the feelings of those around me and communicate about my emotions with ease. 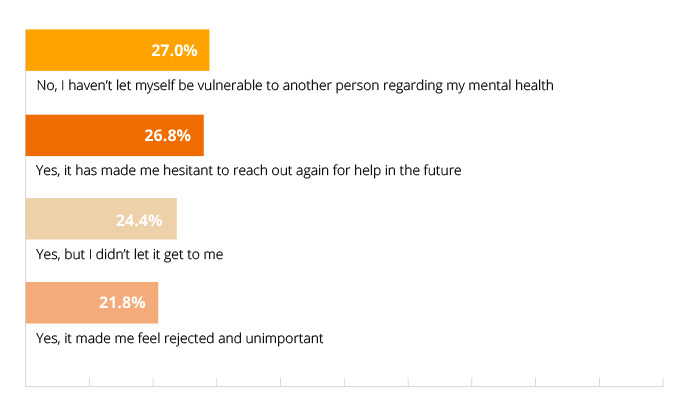 I can sometimes place how I feel, and how other’s feel, and sometimes I can communicate about emotions. 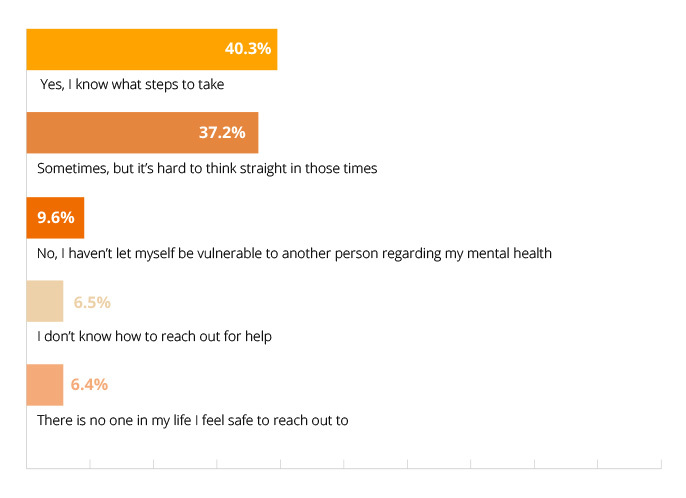 I consider myself emotionally aware, but don’t feel safe to talk about emotions. 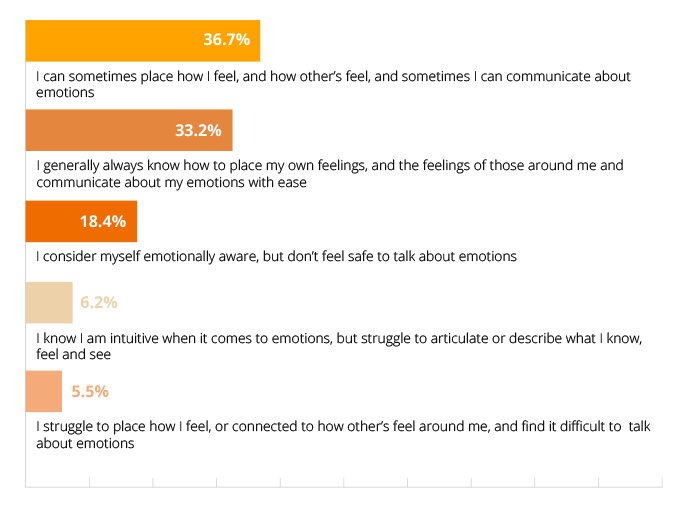 I know I am intuitive when it comes to emotions, but struggle to articulate or describe what I know, feel and see. 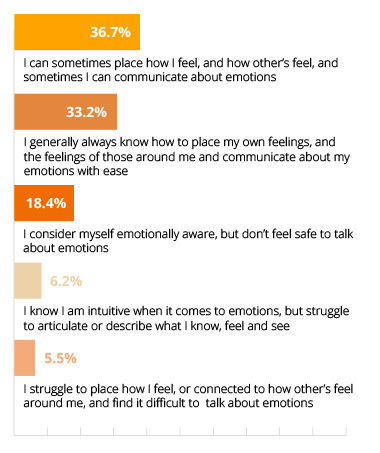 I struggle to place how I feel, or connected to how other’s feel around me, and find it difficult to talk about emotions. 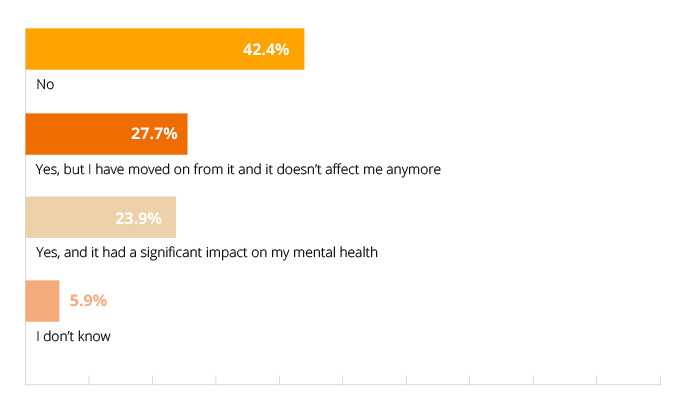 36.7% of Australians surveyed said they can sometimes place how they feel, how others feel and sometimes they can communicate about emotions. 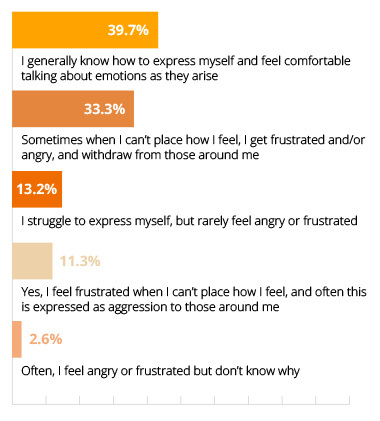 Yes, I feel frustrated when I can’t place how I feel, and often this is expressed as aggression to those around me. Sometimes when I can’t place how If eel, I get frustrated and/or angry, and withdraw from those around me. 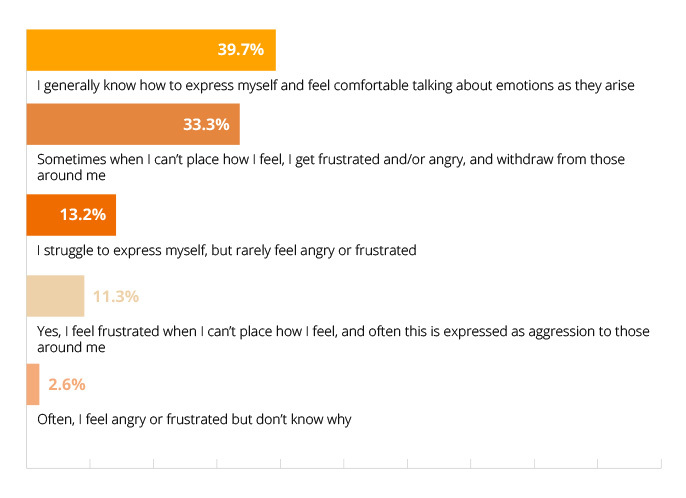 I generally know how to express myself and feel comfortable talking about emotions as they arise. 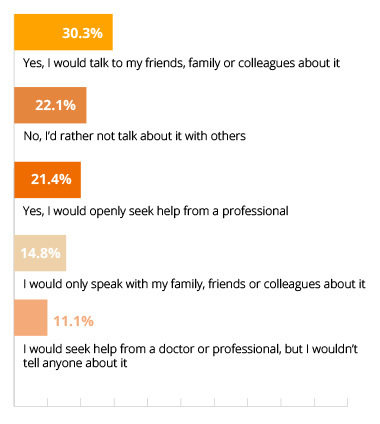 39.7% of Australians surveyed said they generally know how to express themselves and feel comfortable talking about emotions as they arise. 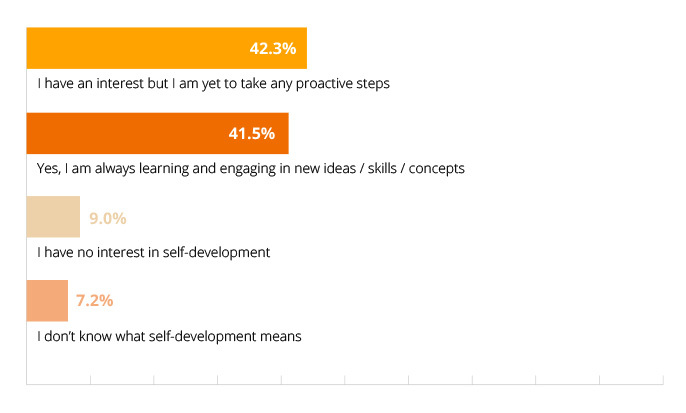 40.3% of Australians surveyed said yes, they know what steps to take. 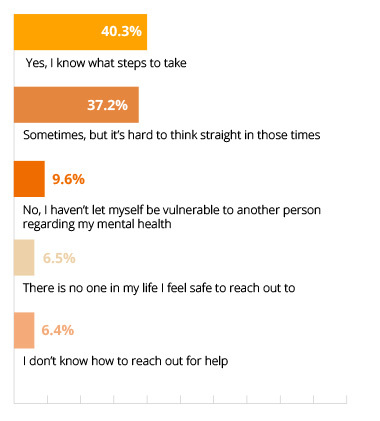 49.4% of Australians surveyed said sometimes, but they know they could do more. 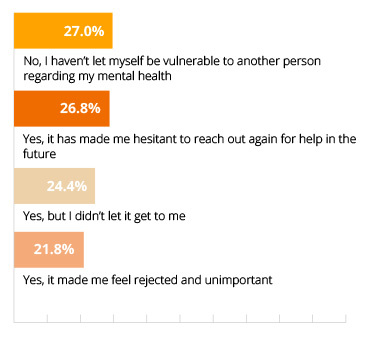 27% of Australians surveyed said no, they haven't let themselves be vulnerable to another person regarding their mental health. 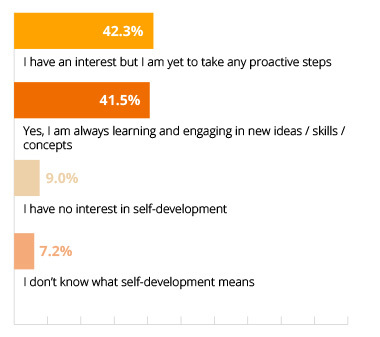 42.3% of Australians surveyed said they have an interest but they are yet to take any proactive steps. 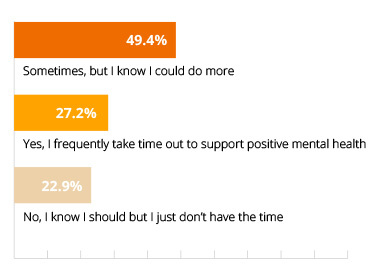 48% of Australians surveyed said sometimes, but they also experience periods of disconnects. 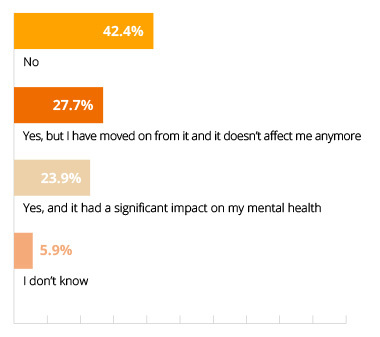 42.4% of Australians surveyed said no. 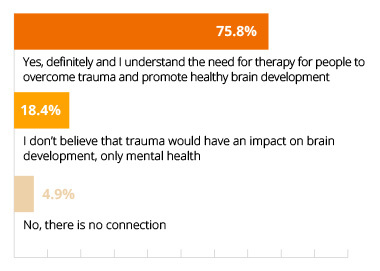 75.8% of Australians surveyed said yes, definitely and they understand the need for therapy for people to overcome trauma and promote healthy brain development. Enter your email to see how you scored against the national average in emotional intelligence and we'll email you a personalised 7-day program designed to strengthen your mental health.